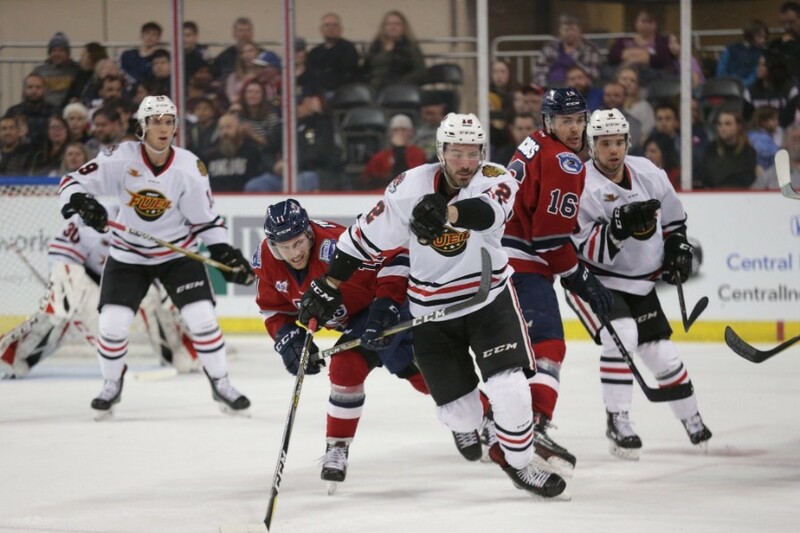 The Indy Fuel returned to the ice last night for a game against the Kalamazoo Wings. The Fuel have had success against the Wings this season, and that success continued in this one. It was a hard-fought battle all game long, but the Fuel took the 4-2 victory. The Fuel struggled out of the gate, playing slow and not connecting on many of their passes. Kalamazoo had no trouble getting their fair share of shots on goal. Indy, on the other hand, didn’t register their first shot on net until 8:36 of the period. Just as the Fuel looked to be stepping up their intensity, the Wings opened the scoring. It was Tanner Sorenson who broke the ice with his 11th goal of the season. That goal appeared to take a lot of the energy out of the home team, who got outshot 12-4 in the first period and went to the locker room down 1-0. The Fuel started the second period with a whole new energy. They played much more physically than in the first. It wouldn’t pay off right away, but just after a Kalamazoo penalty expired, Josh Shalla tied the game at 1 with his team-leading 18th goal of the season. Just seconds after Shalla’s tally, Connor Moynihan shoved the Wings’ Reid Gardiner to the ice. Moynihan picked up a minor penalty for roughing. The Fuel killed the penalty but faced plenty of shots. By the end of the period, Matt Tomkins had already faced more shots than he did all game in the Fuel’s last outing. Meanwhile, the Fuel only had 15 shots of their own. The Fuel got off to a fast start in the final frame. Just under three minutes in, Josh Shalla put his second goal of the game and 19th goal of the season behind Wings netminder Keegan Asmundson. The goal was originally waved off, but further review deemed it a good goal. Indy went on top 2-1. The lead would last for just 49 seconds. Kalamazoo’s Kyle Thomas tied the game at 2 with his seventh goal of the season. Tomkins kept the game tied with a handful of sprawling saves after Guillaume Naud got caught for slashing. Just a few minutes later, Kalamazoo’s Matt Joyaux speared a Fuel player and went to the sin bin for four minutes with the double minor. Kevin Dufour took advantage when he scored on the power play, giving Indy a 3-2 lead. It was his 18th goal of the season. Ryan Rupert put the finishing touches on the 4-2 victory with the empty net goal with less than five seconds to play. The Fuel hit the road today to take on these very same Kalamazoo Wings. Indy is now 5-1-0 against the Wings this season and will look to continue that success this afternoon. The puck drops at 3:00 pm ET.